Finally, the last calendar you have to buy! It’s not the end of the world or anything, but his calendar can be changed with a few clicks of your mouse to fit the current year and months. That’s right, you can use this calendar year after year to keep track of the weeks. Better yet, you can also use this fantastic calendar to manage your schedule as well. You will simply click the day you have planned something and enter that item into the calendar to find later. It really is that simple. If you want to download and learn how to use this template, read the instruction below. 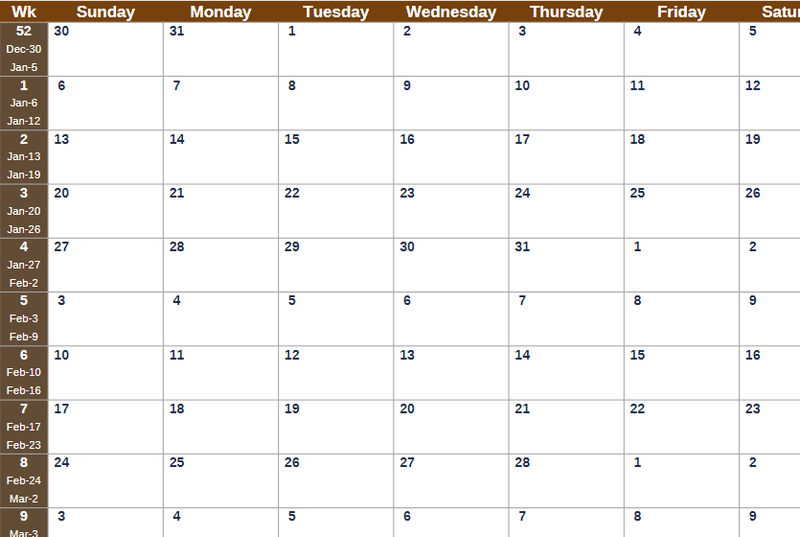 The Reusable Monthly Calendar has a few handy selection options at the top of the page. You will probably understand how it works after a simple glance. You will just enter your current year, month, and finally, the day of that month and the Monthly Calendar will start you off in that space on the calendar. The first column in the main table will give you the current weeks in the year and the rest of the columns list out the days of your week. After you have made your selections for the current date, you’ll begin to enter information regarding your schedule. Let’s use an example. Let’s say you have a birthday party on the 28th of your current month. You would simply click inside the cell marked “28” and type a description like “Bob’s Birthday.” From this point, you can choose another date, prior to that, and select a day to buy Bob’s gift as well. When you want to start a New Year, you would simply scroll back to the top and enter the New Year in the appropriate spaces. The Reusable Monthly Calendar will reformat your document to fit that year. You’ll finally have all the tools you’ll need to make this a successful and well-organized year. Download this free template today.